If you shoot street photography, you’ve certainly come across angry or belligerent subjects. They don’t usually beat you on the head with a skateboard though, as a miffed mohawked man did to a photographer in Austin, TX. The man who was assaulted said he had been taking photos of “anything that was remotely interesting or unusual,” according to the affidavit. When he photographed 23-year-old Johnathan Washburn’s mohawk, Timothy Beard, 19, told him to delete the picture from his digital camera, according to the affidavit. The man refused and Beard took his $100 Oakley sunglasses, the affidavit said. When the victim tried to get his sunglasses back, according to the affidavit, Washburn hit him on the left side of the head with the skateboard. This seems odd because mohawks are in my mind aggressively look-at-me hairdos, so wouldn’t you be accustomed to the attention? By the way, Washburn was charged with aggravated assault with a deadly weapon and Beard was charged with theft. This is just one of those encounters that’ll occur when shooting street. 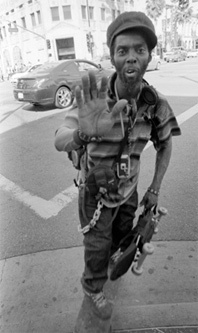 This guy tried to hit me with his skateboard after I took this pic. Cinemafia knows since he was there.